I’ve always loved onion rings, especially when they are hot and crispy, with a great outer texture. But I’ve always hated the way I feel after eating too many of them, because I can never stop at just one. The same goes for Bhajias, a fried Indian snack that I love, especially on cold days, and can never stop at just having one. 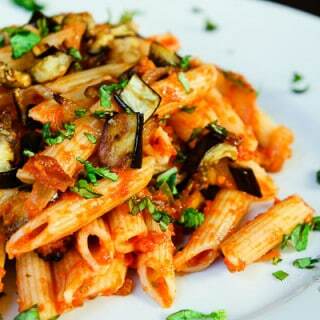 So I decided to recreate healthier baked versions of some of these favorites so I can enjoy as many of them as I want. 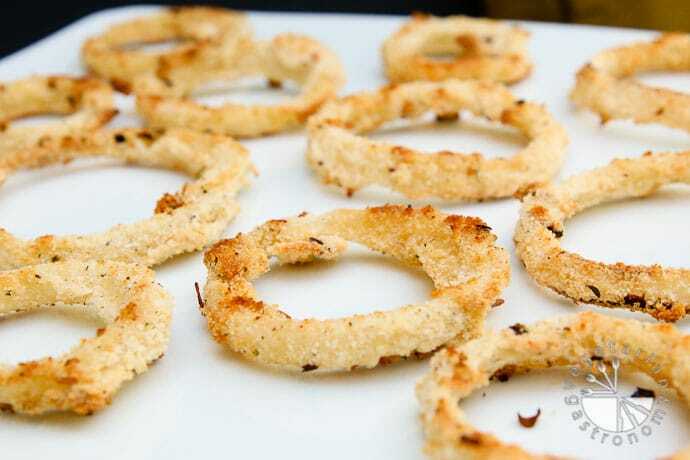 First on my list were Onion Rings, since they seemed to be the easiest to develop. When it comes to onion rings, whether they are thin or thick, heavily battered thick rings or lightly battered onion straws, I like them all. However, they do need to be crispy all the way through, so I don’t find the onion sliding out with the first bite. So, for this recipe, I decided to keep them light and focus on the texture and flavor of the onion rings. I sliced the rings fairly thin, but not so much that they were flimsy. I also wanted to keep the batter pretty simple and light, so that the onion rings had just enough of a wet coating to allow the dry seasoned coating to stick to them prior to baking. I tried a few different baking temperatures but found a higher temperature to work the best, cooking the onion inside, but still keeping it crisp, while creating that perfect outer coating. I used some olive oil spray (which I highly recommend) to lightly coat prior to baking. 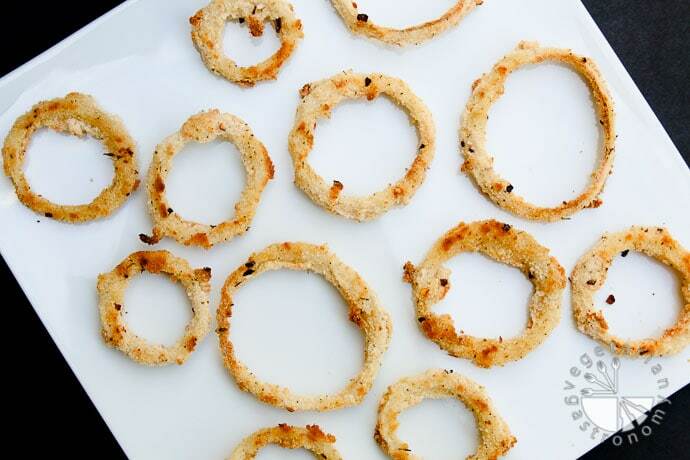 In the oven they went, and out came the perfect thin and crispy onion rings! These onion rings were delicious! I devoured the first entire tray of onion rings just standing over the counter. No dipping sauce necessary…they were that flavorful! Thin, crispy, and perfect. The best part was that I didn’t have to watch how many I ate since they were baked with a minimal amount of oil. We enjoyed another batch of these baked seasoned onion rings for dinner that night to go along with my Potato Fritter Sliders. I used leftover Vegan Chipotle Green Onion Aioli as a dipping sauce. 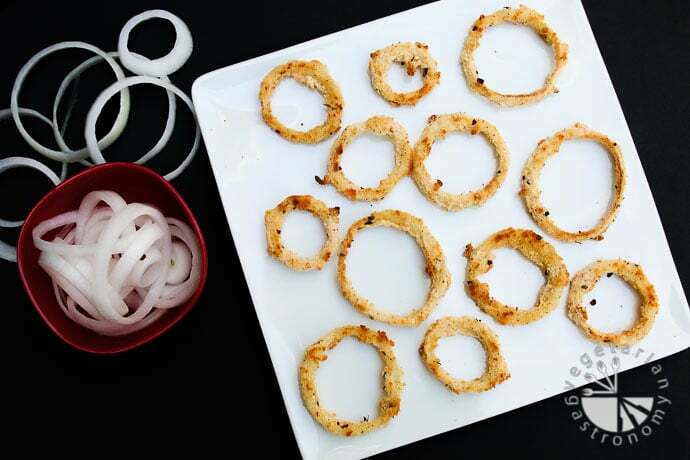 These onion rings make the perfect side or afternoon snack. Even my kids enjoyed them. Keep an eye out for my version of baked vegetable Bhajias. I’m experimenting with the recipe as we speak, so hopefully they turn out just as great! 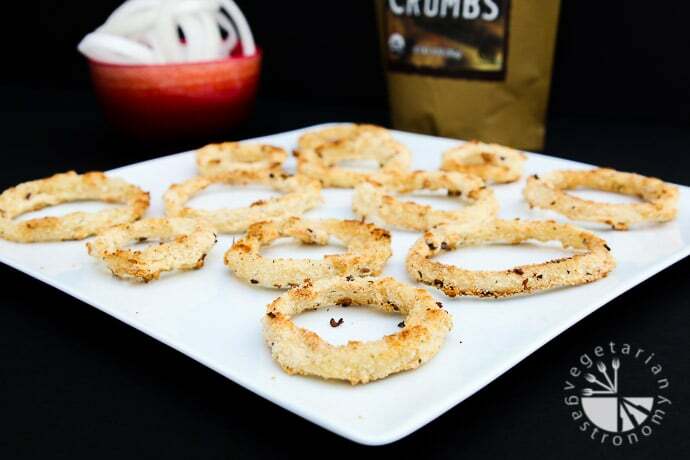 Enjoy these healthier baked onion rings, without having to sacrifice crispiness or flavor! Peel the onion. 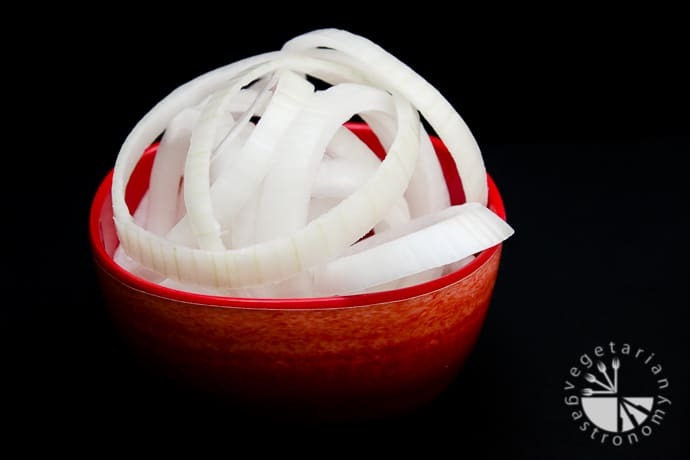 Slice the onion into thin slices (but not too thin, otherwise they will be flimsy break and difficult to handle). 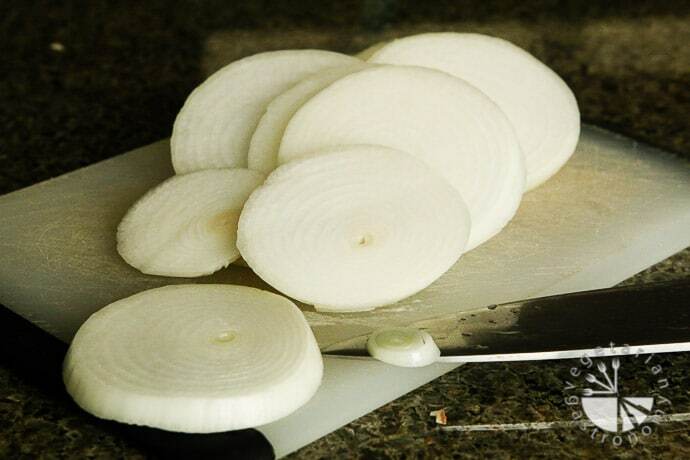 Separate the onion rounds for the onion rings. Whisk together the flour and water. Set aside. 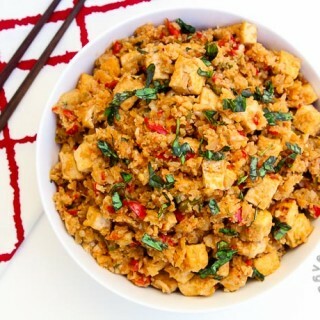 In a separate bowl, mix together the ingredients for the seasoned breadcrumbs. When using the breadcrumbs, take batches of prepared breadcrumbs at a time into a separate bowl to use in order to avoid ending up with a clumpy breadcrumb bowl (due to dipping the flour coated onion rings into the breadcrumb mixture). Line the onions, flour/water batter mixture, and seasoned breadcrumb bowls next to each other and next to the prepared baking tray. Whisk the batter once more prior to starting. One by one, place each onion ring in the flour batter and coat well, then place into the seasoned breadcrumbs and coat well all around. If you find that your breadcrumbs start to get clumpy, feel free to replace them with fresh ones. Place the prepared onion ring on the prepared tray. Once the tray is filled, lightly spray some olive oil on top of the onion rings. Place the tray in the preheated oven and bake for about 6 minutes. 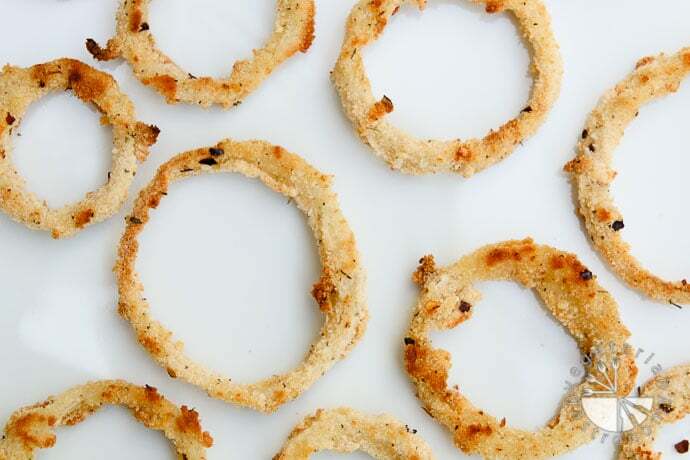 Carefully flip each onion ring, and bake once again for 2-3 minutes until crispy and slightly browned (but not burnt). 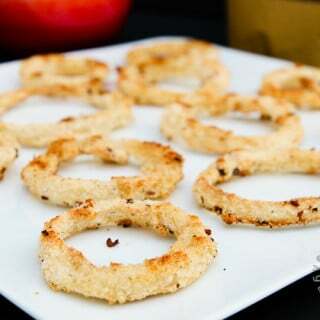 Note that ovens may vary, and since baking time is short, watch the onion rings frequently to ensure they do not burn. Serve hot and fresh. I devoured them as is without having to dip them in any condiment, but they also taste great with some of my Chipotle Green Onion Aioli or Vegan Cucumber Ranch! Olive Oil Spray - I prefer to use olive oil spray for a lot of my baking and cooking to minimize the amount of oil when baking. Most of the times you do not need that much, if any at all. 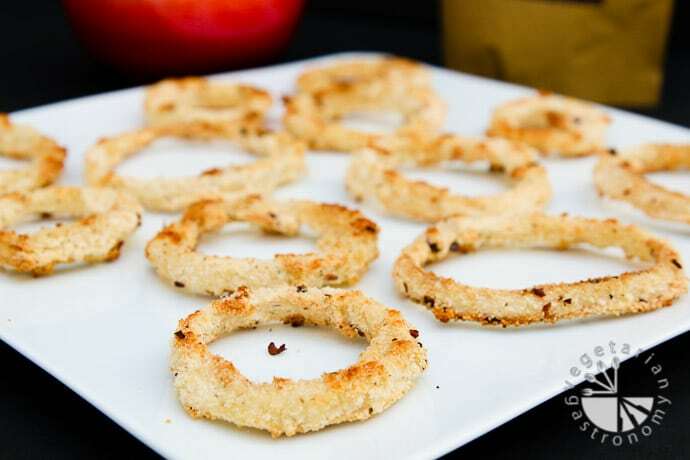 If you do not have olive oil spray, you can simply lightly brush olive oil on the entire pan prior to placing the coated onion rings, and then lightly brush the top of the onion rings as well prior to placing them in the oven. Baking - I also prefer to bake directly on the tray for these onion rings, but you can line the baking tray with parchment paper as well. For Gluten-Free Option - Use gluten-free flour and breadcrumbs. Baked onion ring ? Wow no more frying and test good too. Plus healthy.